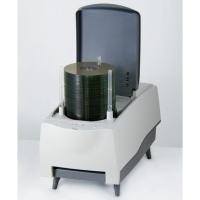 Nimbie USB is a compact automated disc loading system with 100-disc capacity. Nimbie USB offers a low cost solution for users who require multiple applications in CD/DVD auto-loading systems. For any individual, organization or office, Nimbie USB provides the best performance at the most affordable price. Copy CD, DVD or Blu-ray discs. 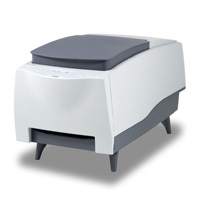 If users wish to make copies from different master discs at once, simply interleave master discs and blank disc to perform multi-master disc duplication. Back up your discs by saving the files or disc images to hard drives. Simply load the discs to the loader, Nimbie USB and QQboxx will do the rest in automation. Convert audio tracks to digital audio files like .mp3 files which can be saved on hard disks, iPods or MP3 players. 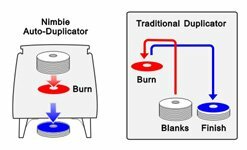 With the patent-pending top-feeding loader, refilling discs is as simple as adding more on top of the existing ones, making it possible to duplicate an unlimited number of discs without interrupting ongoing project. The discs will be processed in FIFO (first in and first out) order. Traditional auto-loaders use a robotic arm which moves back and forth to pick up, load and unload discs one at a time. Nimbie employs independent loader and unloader eliminating redundant arm movements, shortening the cycle time, and increasing the production. Traditional robotic designs are often complex, inefficient and cumbersome, with moving parts exposed outside, which may fail or require adjustment due to accidental damage from external forces. Nimbie's disc exchanging design is completely enclosed in a compact stylish housing which avoids accidental access and ensures reliable, long-term, maintenance-free operation. Discs in Nimbie are also protected from dusts when lid is close. Nimbie comes with a 1-year limited warranty. Please contact Acronova for details! PC ONLY, Windows XP/Vista/7, USB 2.0 Required.